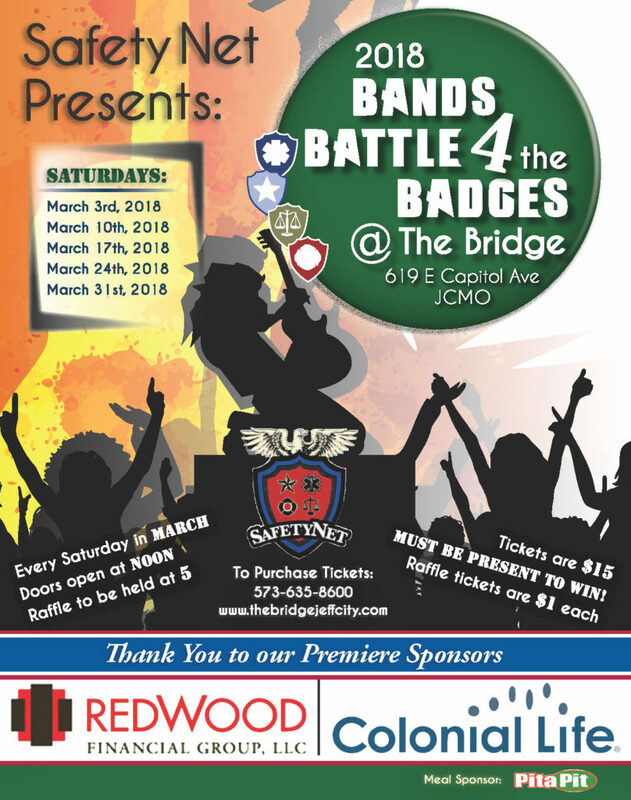 Every Saturday in March, Safety Net Presents Bands Battle 4 the Badges. Bands will compete at the Bridge, 619 East Capital Avenue, in Jefferson City. Bands will perform every Saturday in March 2018. Hold these dates to attend: March 3, 10, 17, 24 and 31. Doors open at noon each Saturday at The Bridge, 619 E. Capitol Avenue, Jefferson City (downtown behind Avenue HQ), with performances beginning at 2 p.m. There will be prize drawings and a 50/50 raffle drawing starting at 5 p.m. each Saturday, with a Grand Prize drawing on March 31. Tickets are $15 in advance or at the door with all proceeds going to support families of fallen law enforcement officers, EMS, fire, and corrections officers located within Boone and Cole Counties. The event features five Saturdays of band performances. Each Saturday, three bands will perform with a winner identified at the close of performances. On the fifth week, each of the four winning bands will face off in a finale performance on March 31. Bands Battle 4 the Badges features a total of 12 bands. Each Saturday, two celebrity judges and the audience will vote to determine the winning bands based on performance, audience reaction and overall energy. To view the list of bands or to purchase tickets, visit Facebook and friend The Bridge or Safety Net of Missouri. To purchase tickets, visit The Bridge Facebook page and click on the Events link to order online or send a Facebook message. Check out the Facebook Event for additional details!